Running a restaurant isn’t easy. Between the stress, the long hours, the startup costs and the razor-thin profit margins, you have enough on your plate. It’s 2018, and there are countless applications and other technology tools that can help make the modern restaurateur’s job easier — or, at the very least, a little more efficient. Technology can’t run the restaurant for you (yet), but it can sure help. Here are some of our top picks for apps and tech tools that will streamline the job. Every restaurant needs an online presence. Luckily, there are tons of platforms geared specifically toward restaurants, offering both hosting and content management in a one-stop shop. 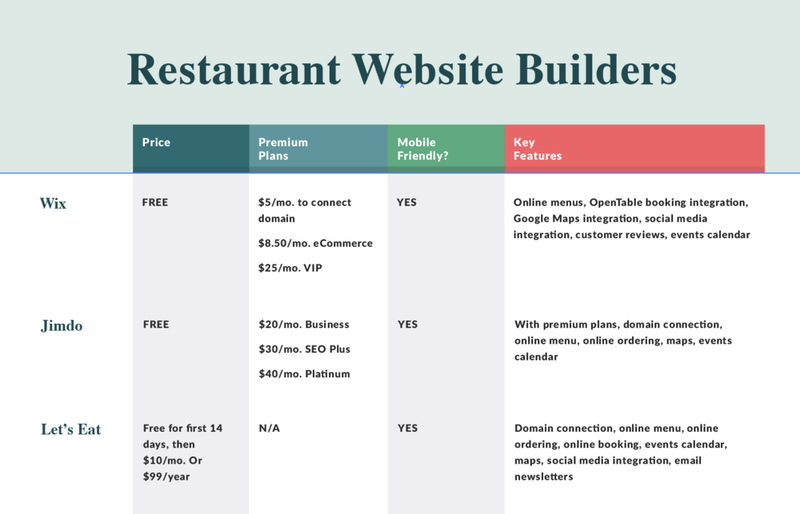 Wix is a popular free website builder that offers restaurant-specific templates and tools. Its easy interface makes designing your business website simple and quick. 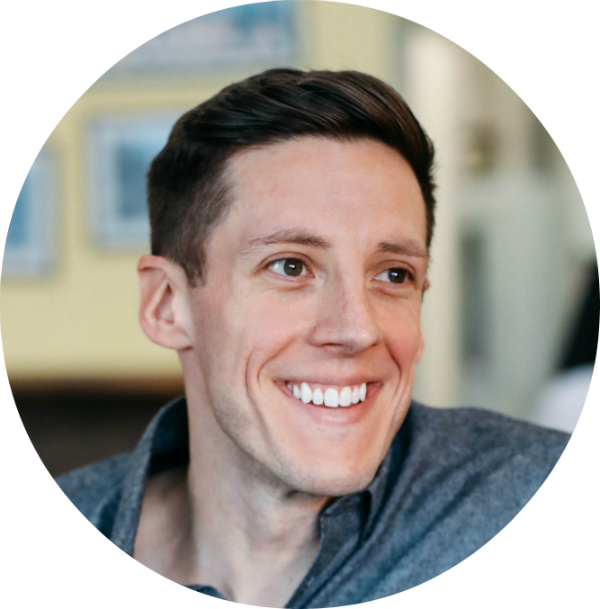 Jimdo might be one of the easiest website builders out there — all you need is a few photos of your restaurant, a menu, and some basic info. Once you plug it all in, Jimdo’s Dolphin AI website builder sets it into a sleek template and you have a functional website in three minutes. More than 15,000 restaurants use Let’s Eat for their web hosting and design, and it’s easy to see why. A simple interface and plenty of useful, restaurant industry-specific features make it user friendly and provide everything you need for your restaurant’s web presence. 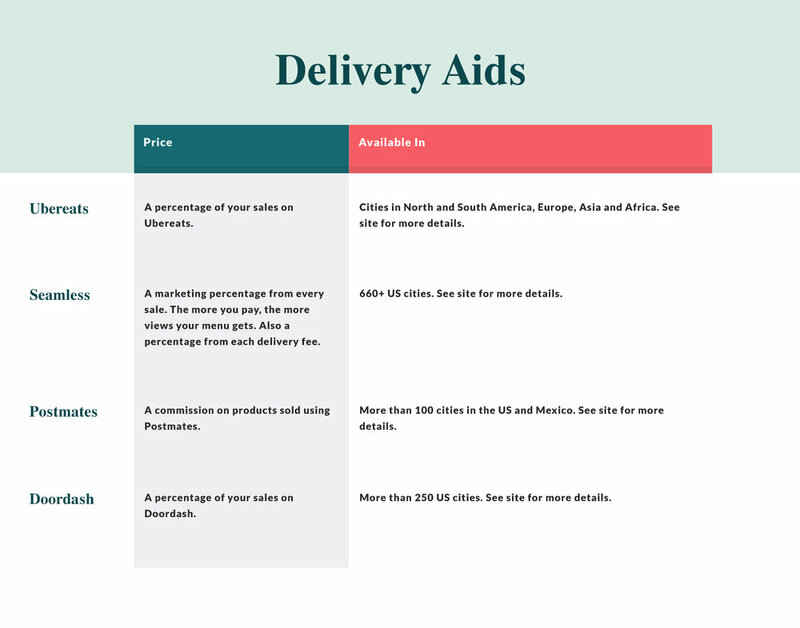 Looking for specific features or price point for your website? Find the platform that best suits your needs here. Ever been working when the POS went down? It’s a nightmare for everyone in the restaurant, from management to service staff to customers. Avoid that by getting the best POS software out there. Toast is one of the very few Android POS systems on the market, which gives it increased flexibility and affordability. Toast also comes with a community where users share best use tips. TouchBistro is iPad based, which keeps hardware costs low. It also offers a free trial program so you can test run it before you commit. Square supports Windows, Mac, Android and iOS to offer all the essential POS capabilities in a simple interface. There’s a reason it’s one of the most popular POS platforms on the market, and has been for years. Lightspeed Restaurant is cloud-based, and streamlines the entire process of managing your restaurant, with useful features and a built-in accounting system. 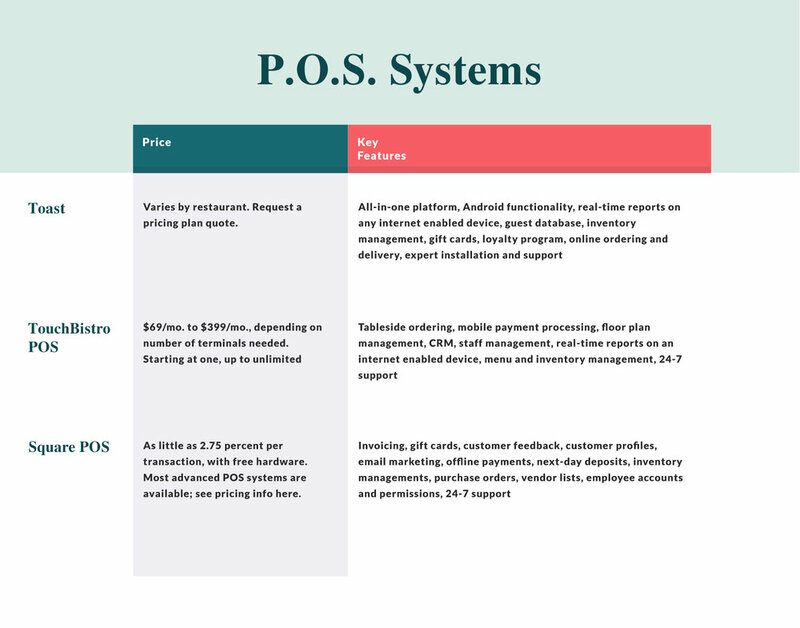 Revel Systems offers one of the most customizable and scalable POS systems out there, allowing you to size your platform for your needs, and integrate only the features that will be most helpful for your business. Find the exact features and price point you’re looking for below. 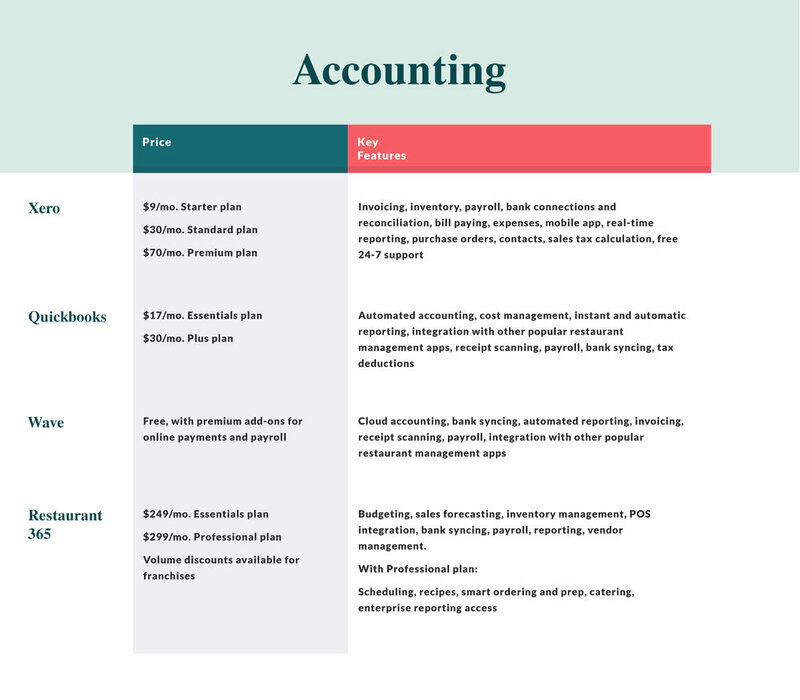 Xero is one of the most popular small business accounting platforms available. It offers real-time reporting and features that will help streamline your entire accounting process. Most business owners are already familiar with Quickbooks, one of the most popular accounting platforms for all small business. With a host of restaurant-specific features, Quickbooks is ready to streamline your restaurant accounting. Wave makes it easy to handle your accounting essentials, all in the cloud so your information is accessible from anywhere. Restaurant365 is, obviously, designed specifically for restaurants, meaning it offers all the features that will make integration with your business as smooth as possible. The most important factor in choosing accounting software is whether it integrates with your existing platforms, like your POS. So check that first. If you’re looking for specific features or price points, see below. One of the most important parts of running your restaurant is having talented, skilled staff. 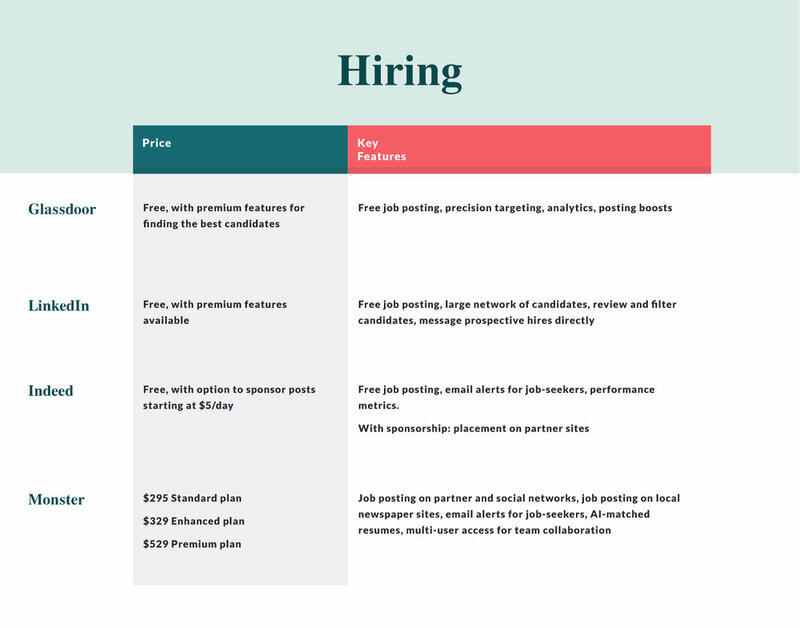 Try these recruiting apps and sites to find the best. A job board, but also a roundup of crowdsourced information on what it’s like to work for a company. LinkedIn is one of the most-utilized job-searching tools available, meaning you’ll find a ton of quality applicants. One of the top job sites on the web, with 200 million visitors each month. A popular, well-known job searching site where plenty of qualified applicants will see your posting. Find the best talent without having to shell out for a recruiter using these budget-friendly online job boards. In 2018, no one needs to leave their house or office for a quality meal. 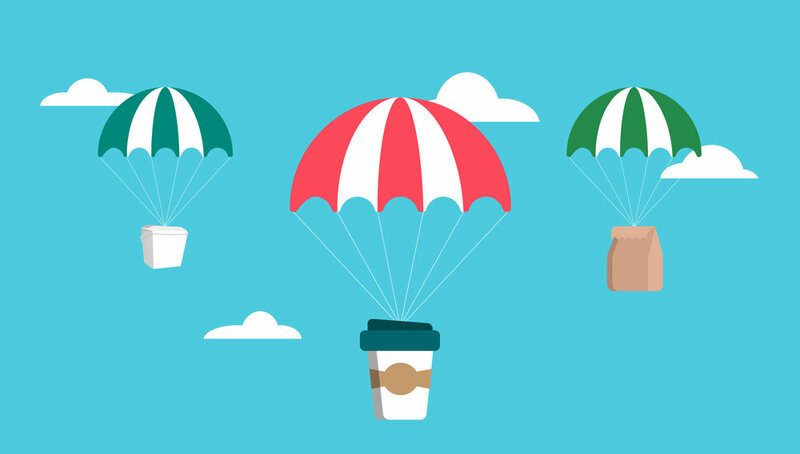 If you plan to deliver to your customers, check out these partners. Deliver meals to Uber customers quickly and conveniently. Orders can even be placed while riding in an Uber, and timed to arrive concurrently. Customers order online to have their favorites brought to their door, with daily discounts and deals. Postmates delivers from restaurants in major markets, but also from other types of retail stores, making it a go-to for many customers. A delivery service that also puts effort into decreasing food waste. The most-used social media platform allows you to share status updates, restaurant contact and location information, and customer reviews—all for free. You can also pay for ads and “boosted” posts, guaranteeing more potential customers will see your content. Great for posting dinner specials and mouth-watering customer pics, Instagram is a photo-based platform that will really let you show off how appetizing your wares look. With a business account, you can link straight to your website from your profile page. Good for short updates and interacting with customers, a good Twitter presence will make your customer service stand out from the crowd. Want to walk customers through your menu, give a video tour of the restaurant or introduce your staff? YouTube’s video sharing platform is the place to do it. Almost all social media profiles are free, and since they all offer different features and reach a different kind of audience, the more of them you use, the better. Now that you’re set up to conquer everything from your web presence to your approach to delivery, it’s time to start rethinking about one of the most essential aspects of your business: your suppliers. When it comes to their supply chain, virtually all restaurants are looking to secure lower prices, better quality (and increasingly, local) ingredients, and to do so with as little hassle as possible. ChefHero is a one-stop shop where you can get all of that done. If you’re looking to switch up your supply game and take your business forward, ChefHero is a key tech tool for your arsenal.